Brisbane is a great location for festivals, sporting and community events, it must be a high priority to have professional event first aid services accessible to all event First Aid Brisbane patrons. Event organisers and the general public have access to event care and medical attention that they will need in case of any untoward medical or first aid incidents. 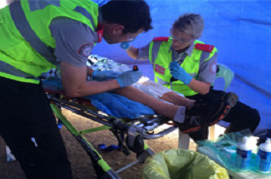 Colbrow Medics can provide Event First Aid Officers and Event Paramedics throughout Brisbane, Gold Coast, Sunshine Coast, Byron Bay as well as Toowoomba and more locations. Colbrow Medics has highly skilled First Aid Medics available to cover your dance and music festivals, sporting or community events. Our medical and health professionals include Advanced First Aid Medics, First Aid Officers, (qualified through Red Cross or St. John Ambulance), Event Paramedics, Registered Nurses and Medical Doctors, allowing us to cater to all your Event First Aid Brisbane requirements. Based on the information you provide us about your festival event, Colbrow Medics will conduct a comprehensive risk analysis and assessment based on the information you provide to us and then determine the number of medical personnel and qualifications we believe are required to safely cover your event. At Colbrow Medics we pride ourselves on our reliability and we are secure in the fact that we won’t let our clients down. Let us prove it to you!